... as in episodes 11 and 12 of the Ugly Voice Productions video, which now is viewable on YouTube as well as here, is found in episode 13 of that beauty, which deals with the mass graves at Sobibor extermination camp. As before in regard to Treblinka and Belzec, Mr. Ugly Voice tries to take his readers for a ride by "estimating" the burial space available at Sobibor on the basis of, believe it or not, two maps and one model that were not drawn or built true to scale and made no pretense whatsoever to accurately represent the relative sizes and distances of the camp’s areas and of the objects located on those areas. The fellow’s nonsense reaches levels that can only be called laughable when he takes one of the maps, the Hagen Trial Map featured on the Aktion Reinhard Camps website, and tells his slaw-jacked viewers that the size of each of the mass graves drawn on that map is roughly the same as the size of a henhouse represented on the same map. Boy, that hurts! Not because the squares underneath the term "Henhouse" are somewhat smaller than the squares representing mass graves, but because even a ten-year-old kid might realize, when looking at this map, that the same was meant to be not an accurate depiction of the relative sizes and distances of the areas and objects shown on it, but a mere means of visualizing the camp’s areas and objects so that accounts of events occurring in the camp could be more easily followed, and that the relative sizes and distances of the areas and objects shown on this map can therefore not be understood as corresponding to reality. And yet, judging by the approving reviews the video has received - including, but not limited to, the enthusiastic praise that led to my article about episodes 11 and 12 -, it seems there are viewers blind and/or stupid enough to let themselves be taken in by such a kindergarten-level hoax. Which is not surprising, by the way, to who has spent some time looking at the world of "Revisionist" lunacy, which is full of fanatics eager to switch off their tiny brains in order to believe what they would like to believe. "We uncovered seven mass graves with an average depth of 15ft. In them there were charred human remains and under them remains in a state of decay. That means that in the final stage the victims were burned," said Andrzej Kola, an archaeologist. He said the largest grave measured 210ft by 75ft, the others 60ft by 75ft. (64 x 22.9 x 4.6) + (6 x 18.3 x 22.9 x 4.6) = 18,308 cubic meters. As in the case of Belzec and Treblinka, this theoretical volume cannot be equated with the actual volume available for burial, because allowance has to be made for the sloping that was probably required to stabilize the graves' walls due to the sandy nature of the ground in which they were dug. Taking this factor into consideration, Alex Bay, in his article on Treblinka, has estimated the available burial volume of a grave with the measurements 50 x 25 x 10 meters at 8,502 cubic meters, or 68 % of the theoretical volume of 12,500 cubic meters that results from simply multiplying length, width and depth. Applying this relationship to the volume calculated above for Sobibor – which may be considered generous given that the graves were not as deep as the Treblinka mass grave in Bay’s assessment – , we get an available burial volume of 12,449 cubic meters. • At 14.8 bodies per cubic meter (pursuant to Charles Provan’s experiment: 184.245 bodies. So we can see that, even by the lowest calculation that can be considered reasonable, the American Football spectator crowd of about 80,000 people that Mr. Ugly Voice tries to impress his gullible viewers with could very well fit into the burial space available at Sobibor, as established according to Prof. Kola’s above-mentioned findings. Unsurprisingly, Mr. Ugly Voice has it all wrong once again. This map was used as evidence in the trial where Karl Frenzel was sentenced to life in prison. Can you imagine getting sentenced to life in prison based on evidence where the space they give for burying 80,000 bodies are two pits not much bigger than the henhouse? I don’t know what could better show the misery of UV’s handling of judicial investigations of the mass murder at the "Aktion Reinhard(t)" camps than his apparent lame attempt to put off the most detailed and thorough such investigations (see my article More Fun With Ugly Voice Productions (Part 1)) with imbecile remarks like that quoted above. 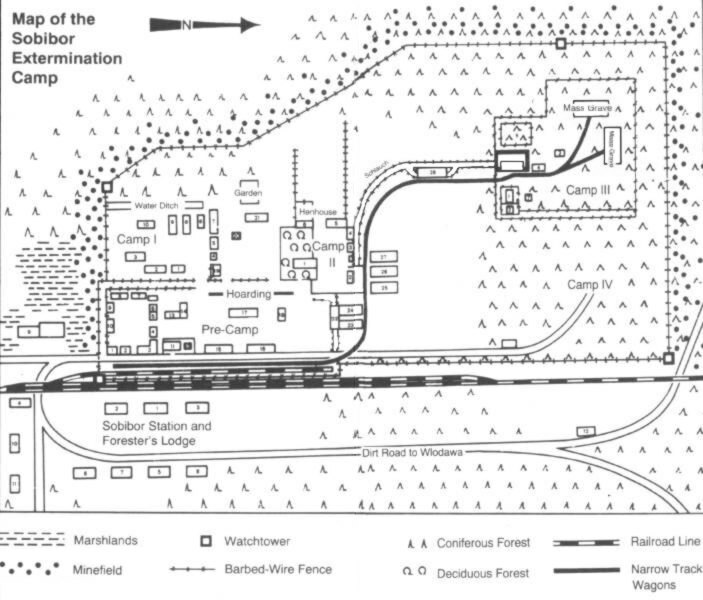 As I said before, even a ten-year-old kid might see that this map was made just for visualizing the camp’s areas and objects so that accounts of events occurring in the camp could be more easily followed, and that the relative sizes and distances of the areas and objects shown on this map cannot be understood as corresponding to reality. Such visualization probably was what the map was used for at the Hagen trial, the incriminating evidence on the basis of which Frenzel was convicted consisting of documents showing the number of Jews who had ended up at Sobibor and direct testimonies by eyewitnesses, who were subject to aggressive cross-examination by defense attorneys, describing Frenzel’s actions at that camp. Frenzel, like other former staff members of the "Aktion Reinhard(t)" camps indicted before West German courts (see my related article), may have tried to play down his involvement in the mass killings at Sobibor and denied having killed on his own initiative, but he never denied the reality of these mass killings – neither at the trial nor at his later interview with Sobibor survivor Thomas Toivi Blatt. Those of our readers who are interested in knowing how Frenzel felt about «getting sentenced to life in prison based on evidence where the space they give for burying 80,000 bodies are two pits not much bigger than the henhouse»(Ugly Voice) are invited to read the record of this interview. Andrejz kola was handpicked by the holocaust museum(s). Do you think that they would pick somebody who's skeptic? Kola wouldn't find something that doesn't support the story. If kola really did go into sobibor, where is his work? Let me see it. It's like your article, "pot, kettle, black." Useless without a report. >Andrejz kola was handpicked by the holocaust museum(s). Do you think that they would pick >somebody who's skeptic? Kola wouldn't find something that doesn't support the story. Great, now try one that is not dependent on silly conspiracy theories. What evidence do you have that Kola was “handpicked” by whosoever on account of anything other than his archaeological expertise, and that this renowned professor of archaeology manipulated the results of his investigation, as you insinuate? >If kola >really did go into sobibor, where is his work? Let me see it. The report on Kola’s Belzec excavations in 1997-1999 also took some time to be published, so you’ll have to wait just a little longer, especially as a continuation of the work seems to have been planned. Meanwhile, you may try explaining what, other than your wishful thinking, your conspiracy theories are based on. >It's like your article, "pot, kettle, >black." Useless without a report. In your useless opinion, that may be so. ">Andrejz kola was handpicked by the holocaust museum(s). Do you think that they would pick >somebody who's skeptic? Kola wouldn't find something that doesn't support the story. In your useless opinion, that may be so." It's anonymous, the same one from above. If kola really did go into sobibor and performed an investigation, why isn't there more publicity for his investigations? I've only heard from kola's report from a bbc website and the Irving website. Why is that? >It's anonymous, the same one from above. >If kola really did go into sobibor and performed an investigation, why isn't there more publicity >for his investigations? >I've only heard from kola's report from a bbc website and the Irving website. Why is that? I have no idea. But that doesn’t change the fact that these investigations took place and that Kola reported about their results as quoted.